Stanley - always a smile on his face! Stanley had put in his time and then some at the shelter. This sweet dog waited every day since early May for the day his new family would discover him. He watched as many of his friends were adopted, but he remained optimistic despite his growing stress levels. Stanley has a lot to teach all of us - stay optimistic and good things will happen to you! Stanley found his perfect new family and as he left the shelter he thought to himself, "I knew they would come for me". Stanley - you've put in your time; now it's your time to enjoy life to it's fullest! UPDATE FROM STANLEY'S NEW HOME: "Words can't describe how happy we are with Stanley! Last year we lost our pittie Jazz after 10 yrs. Everyone who knew her agrees that she was the best dog ever. We NEVER thought we would be so lucky to find another dog like her but I swear ( and now I'm crying again!!!) that Stanley is Jazz in a boy body! Even my sister and brother-in-law were shocked when they met him. We just can't believe how lucky we are to have him. " Spencer - big head, bigger heart! Spencer is a big teddy bear, who happens to be in the body of a blue pit bull. He is a big headed, bigger hearted dog who waited more than 3 months for his forever home. The shelter environment started to wear on him and his kennel presence was very poor. 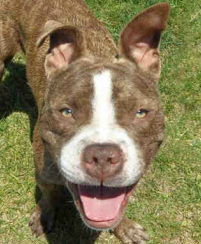 The minute this dog was taken outside he turned into the sweet love bug that he was known as by shelter staff and volunteers. Thanks to San Jose shelter staff, volunteers and the dedicated San Jose Animal Advocates volunteers we were able to get Spencer the needed exposure this great dog deserved. As a result, he went home and has started his new chapter. 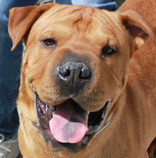 Sasha is a beautiful, young SharPei mix who is simply unique. She is a social butterfly who wants to be with her people and explore new places and meet other dogs. Due to the stress of being in the shelter for almost two months, Sasha became more unpredictable when meeting other dogs, and was deteriorating fast. With the support of the San Jose shelter staff and volunteers, the Last Chance Pet Project team unleashed an aggressive campaign to get Sasha out of the shelter and into a home! Fortunately, GEPDA, a small local dog rescue offered to save Sasha if we could find a great foster home. As a result of extensive networking on Facebook, we found "the perfect" foster home, a loving family and a foster dog sister who would provide company and show Sasha all of the great things she is in store for! Update: Sasha found her forever home on May 4th. She lives happily ever after with a nice couple and their dog Freddie. Facebook ad sponsored by Tracey C.
Everyone knew Lake at the shelter. As a long time resident, she was known for her remarkable housetraining skills, and her loveable nature. Lake was a mom, and was so ready to start a new chapter of life, but waited months for someone to notice her happy face and gentle way. Lake almost was adopted a month back, but it fell through. Nevertheless, she stayed the course, continued to stay patient despite her elevated stress level due to being in a kennel environment for months. All who knew her at the shelter will not soon forget her smile! Facebook ad sponsored by Betty S.
Sammy, Sammy, Sammy....A shelter volunteer favorite whose time had come to an end, everyone was rallying to get Sammy the perfect home. Sammy even made an appearance at Biscuit's Anniversary Block party (Biscuits in Sammy's new favorite pet store! ) Everyone was routing for Sammy and worried that this loveable trusting dog was not going to get a 2nd chance. Just in the nick of time, Sammy found a wonderful home. His optimism and tail wagging will be missed at the shelter, but a big sigh of relief can be heard by all who came to love this stellar dog! UPDATE: Sammy is now Ellington, and he has a new Facebook page where you can follow Ellington in his new adventures. Facebook ad sponsored by Melissa L.
Dallas hit the jack pot when he was allowed to attend an off site adoption event at Petco Unleashed in San Jose with Diana Rapa of The Perfect Dog. 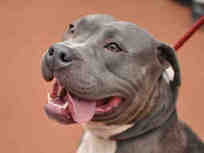 This was Dallas' last chance to find a home as his kennel stress at the shelter was getting worse by the hour. At the adoption event, Dallas found the "perfect family", and now, Charlie Bucket is becoming a Facebook celebrity with his own Facebook page and a twitter account, not to mention a devoted following of animal lovers who knew that Dallas was a great dog. Have fun Charlie! Nathaniel was our first success story! We initiated a Facebook campaign to save Nathaniel, and within 24 hours some kind citizen went down to the shelter and adopted Nate just in time! See Nathaniel's detailed story in our blog post, The Social Network.